Help ensure a better tomorrow for everyone. Donate now to make a difference for hungry kids. Help a child grow today! 11,030 children in the Siouxland area face hunger every day. Many of these children are afraid to admit they don't have enough to eat. With your support, the BackPack Program: Food for Kids will help reach these children. This program allows these hungry children to have nourishment during the weekend, when they do not have access to the meals provided during the school week. Remove the barrier of hunger that contributes to poor school performance and attendance. Reduce health problems in children served by mitigating the negative consequences of under-nutrition. Empower children themselves to help meet their own needs by providing foods they can manage independently that offer essential nutritional values. 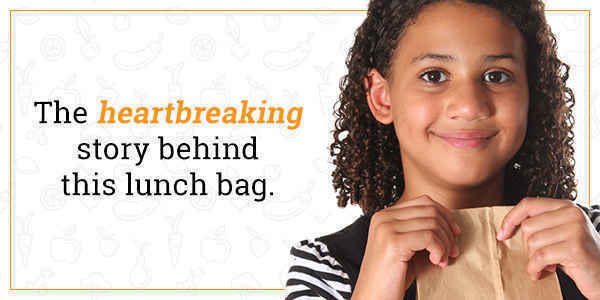 Increase nutritional intake of participating students by providing food sacks of healthy food items, limiting sugars and "empty" calories. This program is supported entirely by gifts, grants and donations. In order to make the magic happen, we rely on the financial support of the community. With each sack costing an average of $4.00, the program expenses are always a challenge for the Food Bank of Siouxland. Please make a donation today to help our school-aged children start Monday off ready to learn with a full belly. Help change hunger for our children. My father cared. I care for him who can no longer give. To celebrate a friendship of over 50 years, I am donating in my friend, Jan’s honor! Thanks for all you do for the children in Siouxland!